Heat presses give you amazing flexibility for customization and efficient production for any apparel business. You can print designs on t-shirts, socks, bags, pillows, sandals, and so much more. The possibilities are endless. If you want to make the most out of your heat press, there are certain things that you should definitely have to give yourself plenty of options. 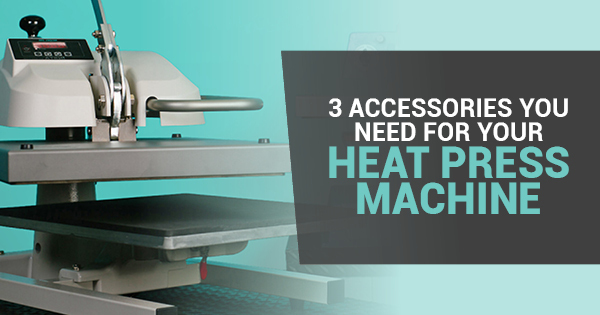 Here are three types of heat press accessories that are must haves. A cover sheets' main function is to offer protection. The cover sheet helps protect the upper plate and prevents any inks, adhesives, or stains from getting on your press. It also protects the garments that you are printing on from the same dangers. This allows the printer to put any kind of design, material, or color on any garment of choice with no worries of ruining the garment or machine. The cover sheet can also give the printer an option of putting a semi-gloss or matte finish on the garment, if desired. This tool is particularly helpful for anyone looking to cut their own designs out of a garment. It can easily remove access material from the printing process. For example, if the print on design bleeds into an area where it's not wanted, a cutter can take care of that in no time. These cutters typically have a thin, sharp tip, so precision is possible every time. Thermo tape is an amazing accessory that can be used in multiple ways. If you are trying to print a design on a t-shirt or a tote bag and don't have a design template or stencil, no worries. You can simply take out the design on the garment, press down the ink, and voila. This tape is great when straight lines, or things like letters and numbers, are desired. There you have it, three types of heat press accessories that are must haves for any heat press owner to make life a breeze.